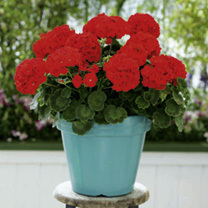 A classic geranium with a branching habit, attractively zoned foliage and a profusion of large, scarlet flowers. The most popular individual colour in the mix of Cabaret. Height 35cm (14"); spacing 30cm (12"). A classic geranium with a branching habit, attractively zoned foliage and a profusion of large, scarlet flowers. Height 35cm (14"); spacing 30cm (12").